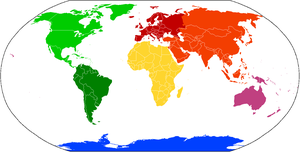 The terms Oceania or Australasia are sometimes substituted for Australia to denote a region encompassing the Australian continent and various islands of the Pacific Ocean that are not included in the seven-continent model. For example, the Atlas of Canada names Oceania, as does the model taught in Italy, Greece and in Latin America, Portugal and Spain. ↑ ୩.୦ ୩.୧ "Continent[dead link]". The Columbia Encyclopedia[dead link]. 2001. New York: Columbia University Press - Bartleby. ↑ ୬.୦ ୬.୧ ୬.୨ [dead link] official Greek Paedagogical Institute 6th grade Geography textbook, 5+1 continents combined-America model, Pankosmios Enyklopaidikos Atlas, CIL Hellas Publications, ISBN 84-407-0470-4, page 30, 5+1 combined-America continents model, Neos Eikonographemenos Geographikos Atlas, Siola-Alexiou, 6 continents combined-America model, Lexico tes Hellenikes Glossas, Papyros Publications, ISBN 978-960-6715-47-1, lemma continent(epeiros), 5 continents model, Lexico Triantaphyllide online dictionary , Greek Language Center (Kentro Hellenikes Glossas), lemma continent(epeiros), 6 continents combined-America model, Lexico tes Neas Hellenikes Glossas, G.Babiniotes, Kentro Lexikologias(Legicology Center) LTD Publications , ISBN 960-86190-1-7, lemma continent(epeiros), 6 continents combined-America model.Note and clarification on the above: the sometimes used in Greece 5 and 5+1 continents models mentioned above are equivalent to the 6 (inhabited) continents combined-America model excluding/including (separately mentioning) the uninhabited and once lesser-known or unknown Antarctica (just like the Olympic Circles-Logo); they don't refer to some other 5 or other number continent modeling scheme. ↑ ୭.୦ ୭.୧ "Continent". Encyclopædia Britannica. 2006. Chicago: Encyclopædia Britannica, Inc.
↑ "Real Academia Española". Lema.rae.es. Retrieved 2013-09-30.